It is not every day that I get to observe and photograph three generations of elephants that just happen to be in perfect symmetry. All I had to do was position the truck forward and backwards until everything came together. This image is a classic case of where two feet forward or backwards was all it took to be in the perfect position. I have been in Kenya now for three full days of shooting, located just outside of Amboseli National Park. During this trip, my emphasis was to be on the massive elephants that roam this area. Any thing else that came my way was a bonus. For this trip I wanted to focus on some specialized shooting which required a different equipment approach. My equipment included a full spectrum IR camera, my medium format Hasselblad, a remotely controlled camera system and my trusty Nikon D850. I also packed my Nikon D4 for some high speed shooting, but more on that later. 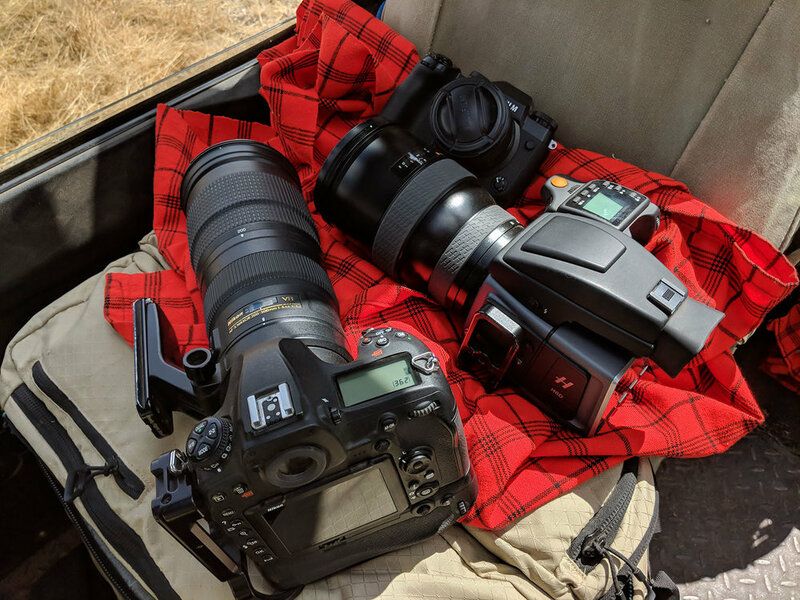 I configured my kit so my Nikon would be dedicated to the longer shots, while the Hasselblad would capture the wide angle to medium angle work. The IR was set with a 16mm super wide angle to capture the massive wide open spaces that Amboseli is known for, hopefully populated with elephants. I’ll be posting a few of the results in future blog postings so stay tuned. A working fisherman captured at first light in Porto Natales, Chile. Chile. After spending time leading a workshop for Muench Workshops in the National Parks of Chile and Argentina, we made an overnight stop at this wonderful fishing town. For me, landscapes are become completely different when people are introduced into the scene. Give it a try, you just might surprise yourself. Standing on icy covered rocks with ice spikes on my boots, I soon became disinterested in the cold nipping at my body. Although I was prepared for cold, nothing really prepares you for working in minus 15-20C. Dig into this file and just look at the details. From the people on the deck of Anthony's to Mount Rainier in the distant, its all there and that's what a medium format is all about. Yes I know, clouds and sunsets like this in Seattle are rare in the winter. Luck was with us. The rain started the next day (again). If a leopard could “work it,” this large female did just that! Our guides were integral in making this already fantastic shoot even better by rotating the vehicles in and out of various positions so each photographer could get their own version of this stunning scene. It’s my daughter Alexis' first time on safari with me and it has been absolutely wonderful to spend time with her in the Delta. She did a great job at capturing two hippos during an emotional discussion today. I’m very proud of her photography skills and have really enjoyed watching her improve during this trip. Spotting African wild dogs (or African painted dogs), in this area of the Delta is rare – there are less than 3,000 wild dogs in all of Africa. We ended our day spending the last light with these special animals. When wildlife is hunting in stealth mode, photography opportunities can be a challenge – you can see how well the cheetah is camouflaged in this environment. Mitch’s approach to focus on the cat’s eyes through the tall grasses proved to be an effective strategy.